Ocean words and beach words. 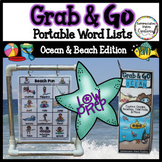 Use portable word walls to explore oceans and beach words. 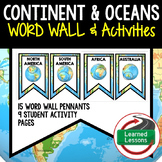 Students can use the thematic word wall in word exploration, writing workshop, to expand vocabulary, and so much more! UPDATED PRODUCT 7/9/17 These word lists are included in the June Edition and July Edition. Set of 16 ocean themed cards with word and matching picture for an ocean themed world wall. Cut out an laminate to make them last longer! Use these letters and first 100 sight words for your bumble bee themed classroom. There is a letter for each section of the word wall as well as the first 100 sight words. This is a word wall pack which includes letter headers as well as word cards for the Dolch Pre-Primer, Primer, and First Grade word lists. Also included are color words and number words (1-20). I've even included a banner "Word Island" for your word wall. Feedback on my products is appreciated! The fun ocean word wall family incorporates the ocean theme while testing the students minds on several vocabulary words. Try using these in centers or you can make a fun game out of it! This product is a set of words that follow the ocean science unit. I have a colored sheet set of word walls and a white set of word walls. One could be use for class display, while the other could be used for students in their notebooks or INB's. 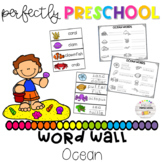 Editable Ocean Word Wall or Vocabulary Word Wall Display w/Printable Mini Book! 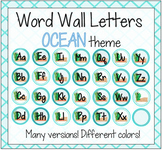 Word wall labels in an Ocean theme. Upper and lowercase letters on each label. Vowel and consonant labels in two different colors. Print on cardstock and laminate for durability.